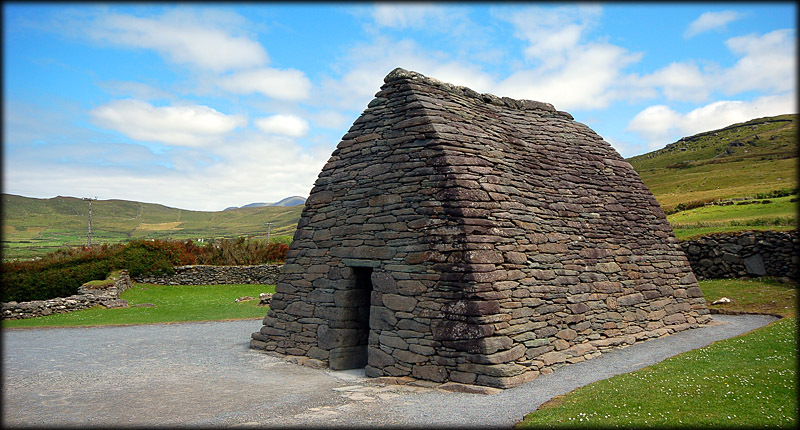 Gallarus Oratory is the most perfect example of the 'Boat shaped' oratories associated with the Dingle peninsula. These structures are shaped like an upturned boats and were built using the ancient corbeling technique. The church is c.6.85 metres long x 5.75 metres externally. Internally the oratory measures 4.65 metres x 3.1 metres. The red sandstone walls are 1.2 metres thick and the east wall has a round headed window. 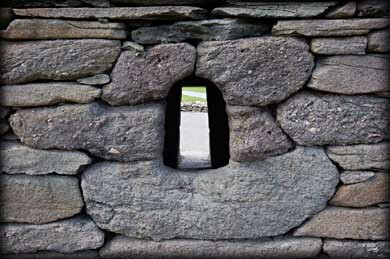 Traditionally it was believed whoever could climb out through the small window would have their soul cleansed, allowing them guaranteed access to heaven. These enigmatic dry stone structures are very difficult to date. The archaeologist Peter Harbison suggests somewhere between the 9th and 12th centuries. 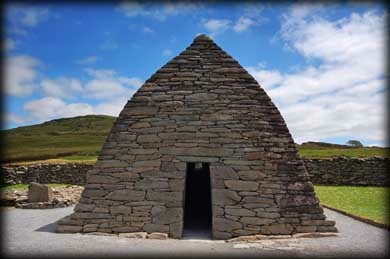 From Ray a UK visitor to our site "A word of advice for people visiting Gallarus Oratory. As you turn off the R559, you will see a sign pointing left up a driveway. Unless you want to pay to see a video and cross a private field ignore it. Continue up the lane for a couple of hundred yards where you will find a small car park and a public right of way to the oratory. Seems like its a local way of fleecing unwary tourists! " Situated: From Ballyferriter take the R559 east for about 3 kilometres you will then see a sign on your left for Gallarus Oratory. Discovery Map 70: Q3929 0491. Last visit July 2011.